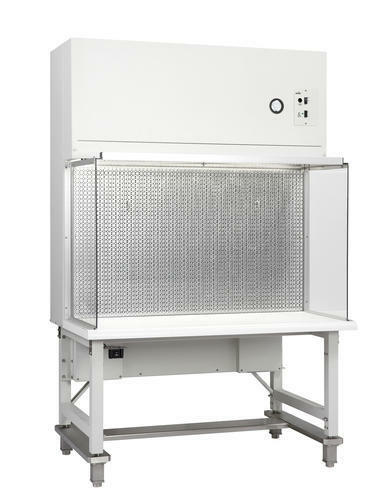 Horizontal Laminar Air Flow Cabinets works on laminar flow principle involves double filtration of air through coarse Pre Filters (upto 5 microns) and Hepa filters (down to 0.3 microns) for filtration of Biological & Particulate contaminants. A constant uni - directional air flows either Horizontally or Vertically, is drawn from atmosphere and passed through pre and Hepa filters on to the work surface. Fabricated out of reinforced pest and weather resistant Duro-board which is clad in from outside in laminated sheet and inner exposed areas are finished in Epoxy paint. Table top stainless steel sheet. Side panels are fixed and made of clear plexiglass. Front door is folding & made of clear plexiglass. Pre filters:- DOP tested as per Standard BS: 2831 with efficiency 90% down to 5 microns. Made of Washable synthetic material.